Sunny autumn days, enjoy ’em while they last! So long coats, hello again jackets! I’m an absolute sucker for bomber jackets. There is something about the fit that makes me buy another one and another one and another one! This one from Titi + The German Kid is not your average bomber though! Squinted your eyes while trying to read the back of my jacket? Read ‘Cooler than Jesus‘ but aren’t sure you read it right? You in fact did! This ‘Cooler than Jesus’ bomber by Titi+The German Kid clearly makes a powerful statement. While I’m definitely not religious and also have nothing against religious people, clothing or fashion in general is something creative and should stay fun. Hence the ‘Cooler than Jesus’ quote. Just simple, easy and laidback! One thing I love to do is pairing down to earth clothing with classier clothing. Most of the time you will find me rocking a chill sweater or jacket and combine it with classic trousers and black boots. It sort of has become my personal style. What are your favorite pairings? Next Post Next post: Wood Wood’s Exclusive Denim Range! Wat een gave look dat jasje Is leuk! Prachtige shoot! Ik vind vooral het tshirt erg leuk! 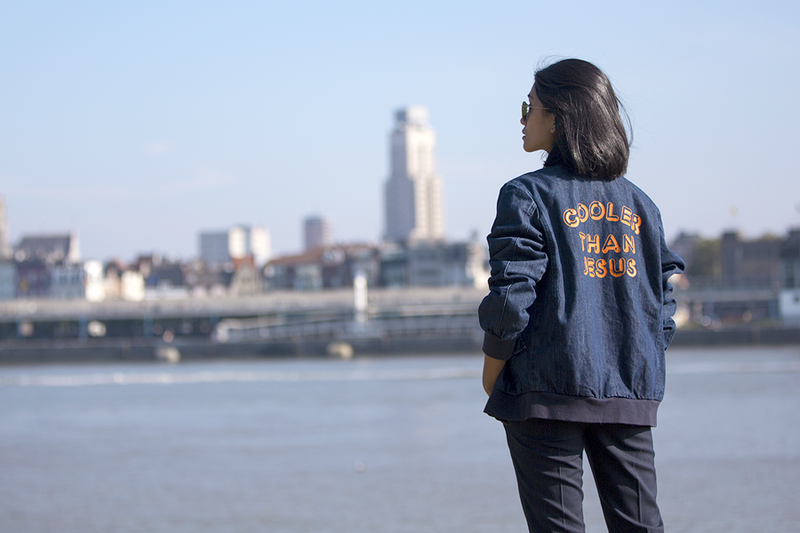 Dat vestje met “cooler than Jezus”… Love it!